Travelling to Korea is definitely in every K-pop or K-drama fan’s bucket list before they kick the bucket – well, at least for me. I’ve been wanting to set foot on the land of kimchi but I was always deterred by the lack of halal food. Even if there is, I wouldn’t want to eat kebabs every day because that defeats the purpose of being there. 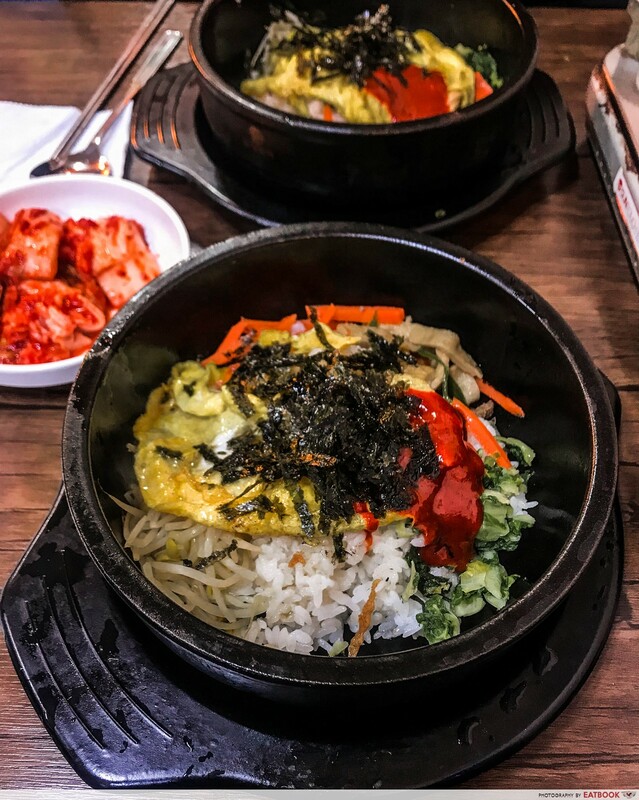 However, if you did your homework diligently, you’ll be surprised to know that there are many halal food places in Seoul. 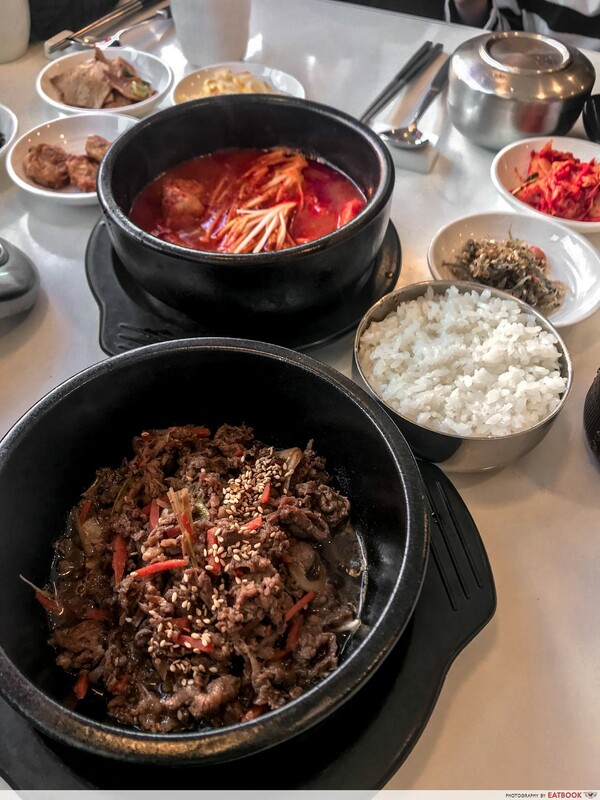 Good news for you, I just returned from Seoul and here’s a list of places that sell halal Korean food. The very first restaurant I headed to for lunch was Eid Halal Korean Food. Their Beef Bulgogi (₩10,000/ ~S$12.50) is unforgettable, and the best bulgogi I’ve had throughout the entire trip. Despite being a very small eatery, their food left the biggest impression on me. 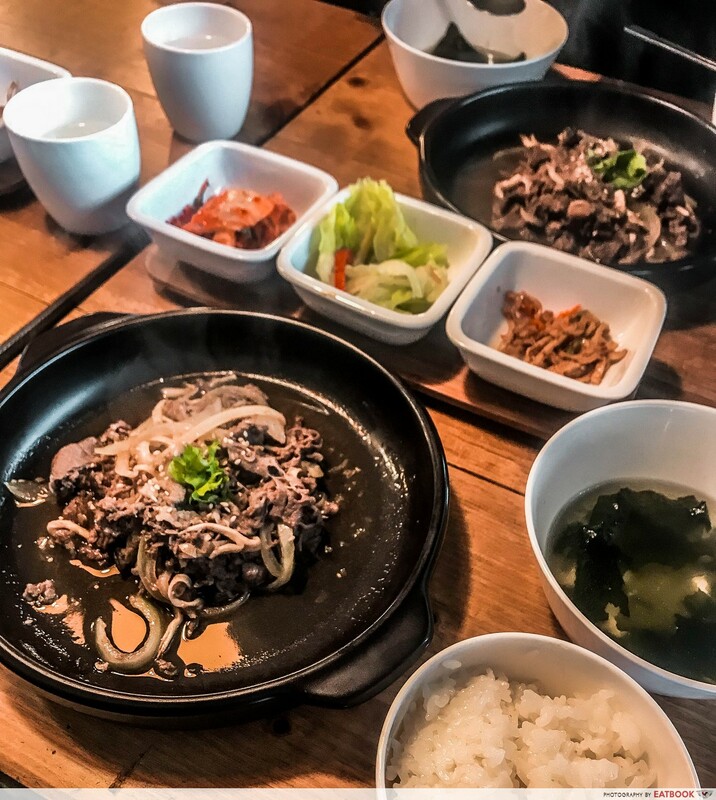 The beef was served on a bibimbap plate, which came along with a bowl of rice and miso soup. I poured my rice into the plate of beef and gave it a good mix, ensuring it was coated with every bit of goodness. Although the slices of meat were thin, they were very tender and flavourful. Each slice was savoury, with hints of sweetness enhanced by the nutty brilliance of sesame. When I think of Gangnam, I’d instantly picture PSY in my head but not anymore after dining at Yang Good. 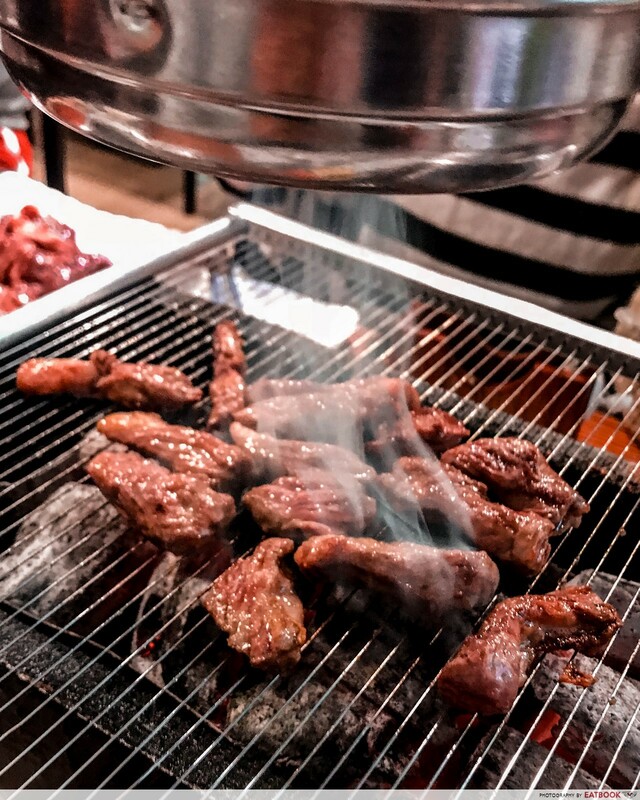 It is a popular BBQ restaurant among locals, and also those who seek halal meat in Korea. Yang means sheep and just as their name suggests, they are known for their delicious lamb meat. I simply couldn’t give this place a miss after reading their almost-perfect ratings. Do note that they have wine and alcohol in their menu but they will not serve it to Muslims and those underage. I tried one of their bestsellers – Short Ribs (₩20,000/ ~S$25). The short ribs were already deboned, making it so much easier to cook and eat. I like that they used charcoal, the real OG way to BBQ. I constantly flipped the morsels until they were cooked till medium. I picked a piece of the meat with my flat chopsticks and popped it into my mouth. What happened next was incomprehensible. As I chewed, it was bursting with sweet and savoury natural juices. It was so succulent, moist, and flavourful that I couldn’t believe I was having lamb. Hands down the best lamb meat I’ve had in my life. No dip or sauce was needed, it was yummy on its own. If you’re planning to go to Korea, this is a die-die-must-visit place. 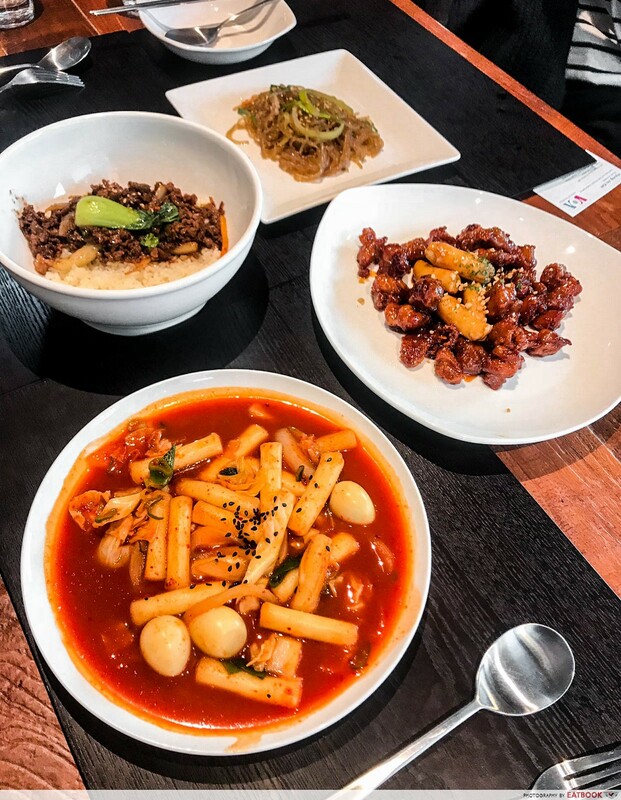 After donning on a hanbok (traditional Korean attire) and walking around Gyeongbokgung Palace, you can drop by Halal Kitchen. Residing among the alleys of Bukchon Hanok village, the place will bring you back to the Joseon Dynasty. This homely place is run by a Korean Muslim. I may have forgotten his name but not his top-notch hospitality. BoA Travel House is a hotel located near Hongik University in Seoul. Sorry to break your bubble but this place has no relation or whatsoever to the Queen of K-pop. They specialise in dosirak (lunch boxes), so you can choose to dine-in or have your meal to go. Their food is much cheaper as compared to other halal restaurants. After being estranged from chicken for a while, we knew we had to get their Half-Half Fried Chicken (₩12,000, ₩20,000/ ~S$15, S$25) which came with two cans of cola for free. We decided to go with both chilli and soy flavours. Its crispy exterior was delish, but the meat was on the dry side and the sauce didn’t fully coat it. I was sad that it was underwhelming, the soy-flavoured ones were their saving grace. Their Rabbokki (₩7,000/ ~S$8.75) was worth trying as it met my expectations. The ramen noodles paired well with the sauce which was slightly sweet and spicy. Skip the Jajangmyeon (₩7,000/ ~S$8.75) altogether, trust me, you can save your wallet and space in your stomach for something better. After nearly emptying our wallets at Myeongdong, surely we couldn’t leave our tummies empty too. Hidden in an alley of the bustling street lies Busan Jib. 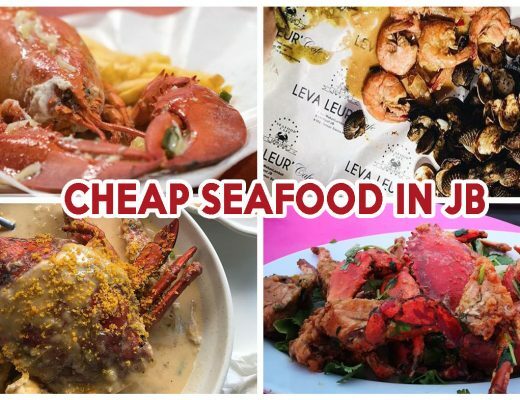 Even though they serve mainly seafood, we went for the cheaper alternatives instead. We decided to get their Bibimbap (₩8,000/~S$10). It came with slices of beef, fried egg, chopped seaweed, carrots, tau gey, seasoned fish cakes, and a dollop of gochujang sauce. Give it a good mix and remember to have it with kimchi, which makes everything tastes better. Since it was -8°C that night, Abalone Ramen (₩10,000/ ~S$12.50) seemed like a great thing to have. The soup came with the umami flavour of the slices of abalone. The hot, savoury, and spicy soup was so comforting, I felt like every cell of my body was defrosting. As someone with a sweet tooth, I am constantly in need of my glucose fix. I was ecstatic when I came across a Croissant Taiyaki food cart among the streets of Myeongdong. 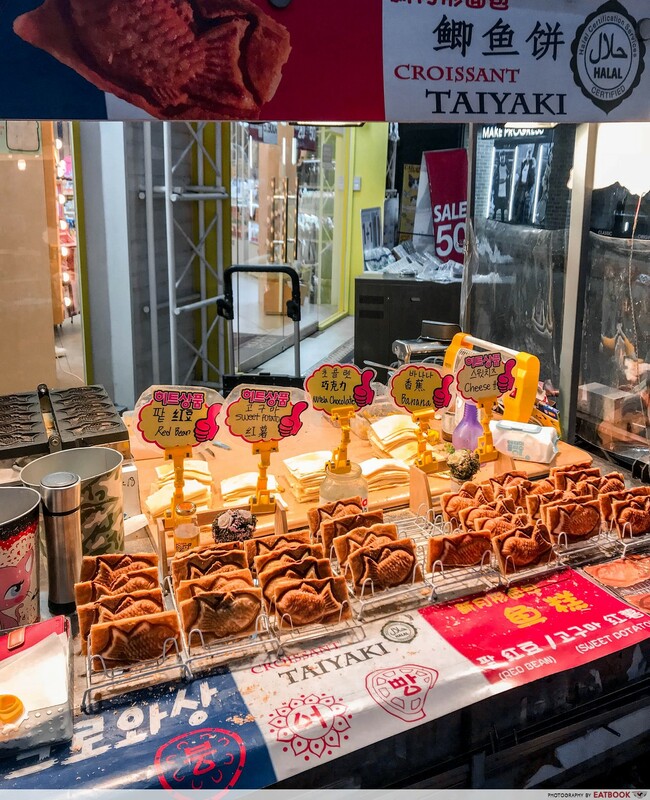 Their Taiyaki (₩3,000/ ~S$3.75) is available in a variety of flavours such as sweetened red bean, sweet potato, banana, cheese, and Nutella. These pastries were piping hot, freshly baked from a moulding pan. A bite of this carp and you’ll be greeted by a crunch and a burst of sweetness. Much to our surprise, it was flaky yet soft, instead of having the regular spongy cake texture. It would have been much better if there was more filling. 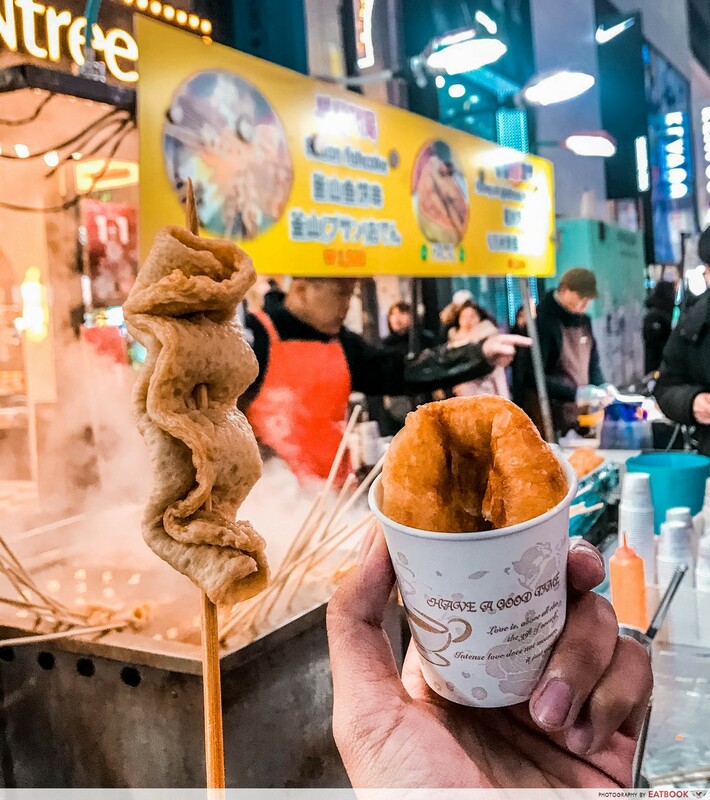 Walk down the streets of Myeongdong and you will find a fishcake and sweet pancake stall. It doesn’t have a name but you can look out for a yellow signboard with a halal logo on it. Though under the same stall, they are run by two separate owners. Try their steaming hot Eomuk (₩1,500/ ~S$1.88 per stick). You can eat as many as you want straight out of the pot. Just show them the number of sticks at the end and pay accordingly. The fishcakes weren’t soggy, instead, they were firm and chewy. The broth was rich in umami flavour, and was well-absorbed into the fishcake. Their Hotteok (₩2,000/ ~S$2.50) is a pan-fried glutinous rice pancake stuffed with brown sugar and sesame seeds. When I bit into the disc-shaped snack, I felt a burst of sweetness coating my tongue. The dough was chewy and soft, which paired really well with the fillings. I wanted to go for seconds but unfortunately, my stomach didn’t have much room left. Itaewon is filled with halal restaurants and Makan Halal Restaurant is located near Seoul Central Mosque. This place is usually packed and we had to come back another time. The next day, we dropped by early so that we could get a table. The Muslim staff there is fluent in English and Malay so communication wouldn’t be a problem. Every table was set with six side dishes, namely seasoned fishcakes, dried seaweed, potato fritters, bean sprouts, fried ikan bilis, and kimchi. I need my meat every day so, of course, I got their Beef Bulgogi (₩10,000/ ~S$12.50). The slices of beef were nicely cut and well-marinated. Its tender meat was packed with savoury and subtly sweet flavours. When eaten with the moist and sticky short-grain rice, it was such a moreish dish that I wolfed down the entire bowl before I knew it. On the other hand, their Spicy Chicken Stew (₩12,000/ ~S$15) was perfect for me. Every spoonful of the soup packed a blazing kick to my throat. The chicken was somewhat tender, a little bit more time on the stove would’ve made it nicer. I must say that it’s a great meal to have during the cold winter. 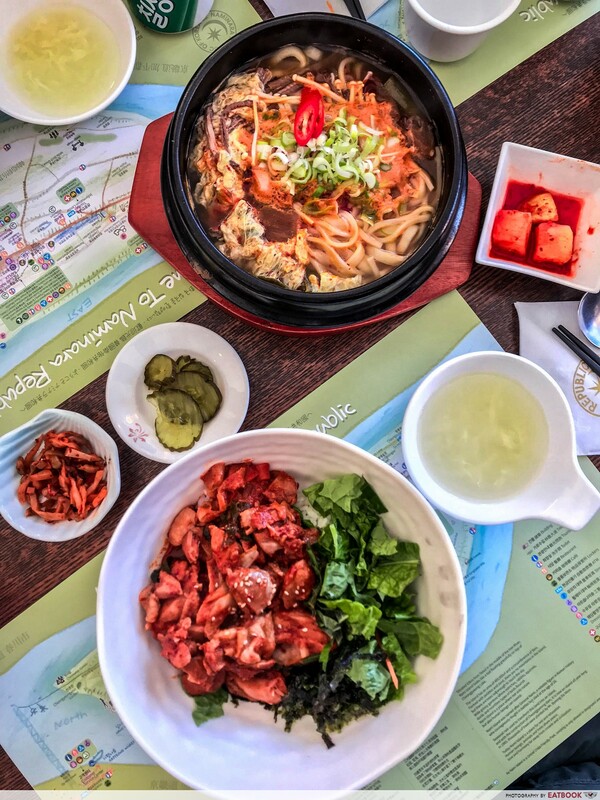 After relieving your Winter Sonata feels around Nami Island, replenish your energy at Asian Family Restaurant Dongmoon. You can also enjoy the scenery while having your meal here. Unlike regular cabbage kimchi, they serve radish kimchi instead. I can’t live a day without rice and meat so I got myself a Chicken Bibimbap (₩11,000/ ~S$13.70). It came in a huge bowl, with the rice buried underneath a layer of marinated chicken, lettuce, and finely chopped seaweed. Give it a good mix and have it with a cube of the radish kimchi. They were very generous with the huge chunks of chicken and I am not complaining. As it was snowing that day, I had to have something hot and soupy to defrost my body after being out in an icy cold -10°C. Beef Soup Noodle (₩12,000/ ~S$14.90) was a perfect choice for me. The flat noodles were QQ, and absorbed the broth’s essence well. The broth, on the other hand, was savoury, spicy, and full-bodied. And to top it off, there were plenty of ingredients such as shreds of beef, eggs, chilli, spring onions, shiitake mushroom, enoki, and kelp. Busan is a large commercial port and they are known for fresh seafood as well as being a safe haven if a zombie epidemic breaks out. If you happen to be there, check out Suminine – a famous seafood restaurant. Upon entering, you’ll be greeted by walls of tanks teeming with live fishes and crustaceans. We got their Clam Platter (₩30,000/ ~S$37.50) and Prawn Platter (₩18,000, ₩30,000/~S$22.50, S$37.50). Their friendly staff member will help you do all the grilling so you won’t have to worry about eating undercooked seafood. Do note that they sell alcohol, but not to Muslims or those underage. Their seafood was undeniably yummy as they were fresh out of the tanks. I couldn’t hold back my expression when I tasted how good their prawns were – succulent, juicy, and sweet. Of course, I couldn’t leave out their heads as well. I found myself sucking it dry, unabashed of how barbaric I looked. The shellfish was as good too. The clam platter came with large mussels, clams, abalone, conch, and scallops. They were grilled with butter and onions to add more flavour. This was probably the best and freshest seafood I’ve had in my life thus far. With this, I’m pretty sure you can now include Korea into your to-go list. There are many more halal restaurants out there so who knows, you might come across another eatery while travelling. 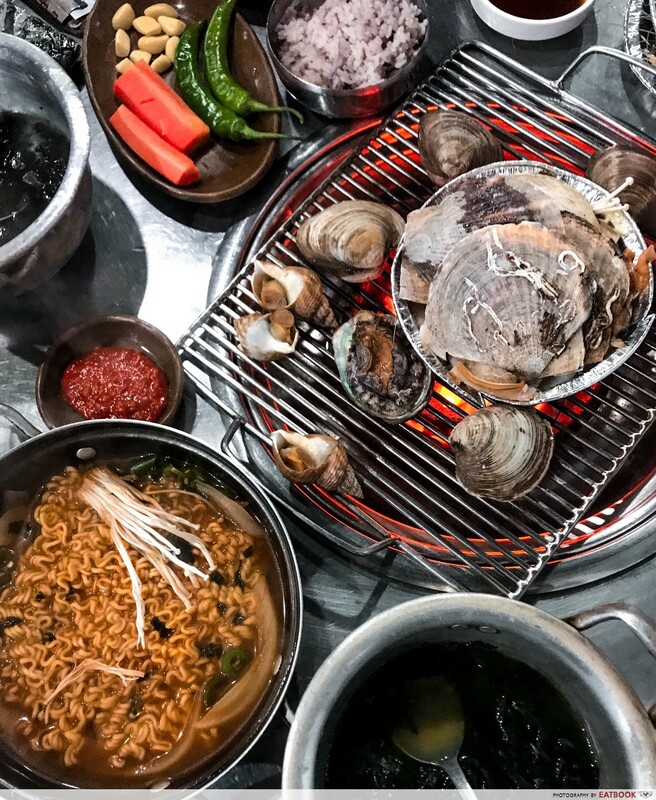 So start saving up and planning for your trip to the land of kimchi. If you know of any places that I’ve missed out, feel free to share with everyone in the comment section down below! 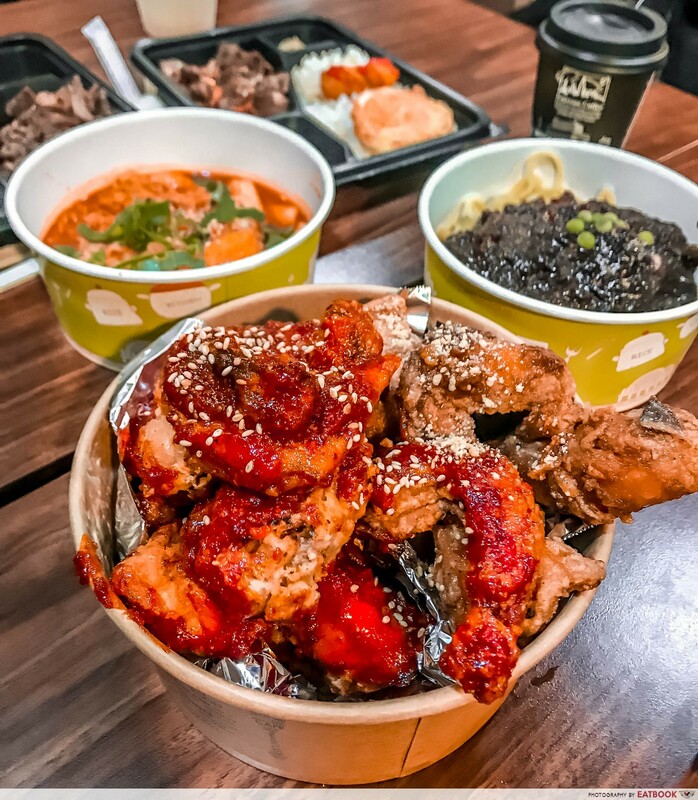 For those who have no plans to travel anytime soon, check out these halal Korean food places in Singapore!